SO, it had come to my attention that the latest burst of baby boomers are a neglected bunch in the hair industry. Do you feel like as you are aging you are slipping in between the cracks? I just want to let you know, I AM YOUR GIRL. A client recently asked me, "What is Your favorite thing to do at work? " I like to help people. I like to give people freedom. Right now, one of the largest groups that needs HELP is the last wave of boomers. Ya'll are amazing, hard working women with an open mind and great attitude towards learning new things. But, like any human being, I have noticed that the collective group of you are conflicted about signs of aging. The idea of "natural beauty" really appeals to you. But HOW do you embrace "natural beauty" when nature doesn't feel so ntaurally beautiful anymore? Let's chat with more about that. You have natural wrinkles, but you may not want to "embrace them". You have a little bit more of a mid section... but, you might rather hide that than call it "natural beauty". You have grey/white hairs, but your not sure that you want to appear "grandmotherly". I would love to offer you my simple steps to aging gracefully. But, where oh where to begin?? 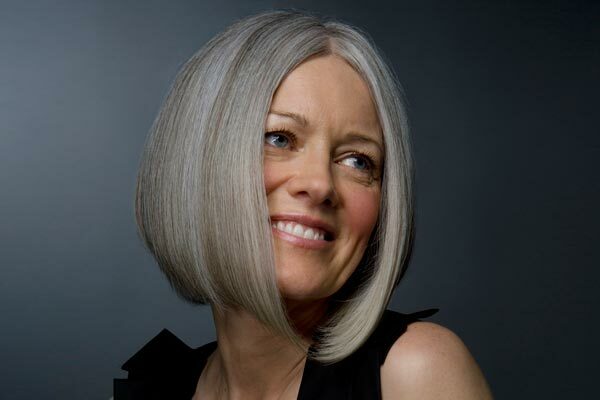 Today, let's talk about hair - GREY HAIR. There are conflicting attitudes in this generation. There seem to be two camps, in general. One side is all about “covering the grey” to “look younger and properly groomed”. The other side is about “aging gracefully," embracing natural beauty, and living a simpler, stress free life. May I give you the professional opinion? I am a millenial generation hair stylist who SPECIALIZES in helping women “go grey”. May I have your ear? Yes? Here is is- NEITHER camp is 100% right, neither camp 100% wrong... WHY? Because, NOBODY seems to know all the other options out there. OPTIONS? YES! YAY! Are you ready? Enhancing the natural beauty of the grey. GREY is beautiful. Everyone’s is different. ENHANCING THE NATURAL BEAUTY OF THE GREY IS THE BEST ATTITUDE TO TAKE (in my professional opinion). You know how you have to put a little makeup on to enhance your natural skin tone, eye shape, lashes, etc? Well, that's how it is with hair. Sometimes to enhance natural beauty, we still add a little makeup up. IN the world of grey, white, & silver, THIS service is quite literally called “grey enhancement”. We've been conditioned since the early days of hair dyes to cover over our grey or be 100% all natural. Thankfully, hair coloring science and technology has come a long way. You no longer need to be chained to the 4 week "root retouch" appoinment. When you enhance your grey or utilize it (instead of covering it up), you get freedom. You get your natural beauty back, your time back, oh, and more money in your pocket.